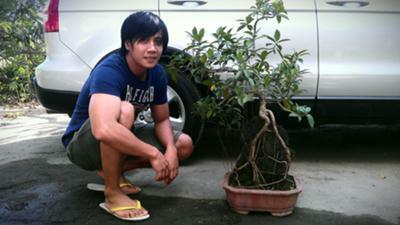 I choose Ficus as my Bonsai specimen on this kind of style, on top of rock. It has its ability to reproduce rigorous roots which is essential in grasping the rock to have its firm stand. I've been training it for 4 years, in which the trunk then was a size of my pinky as you may compare result now almost twice of my thumb in actual size. Patience counts alot before we can produce atleast a convincing miniature tree. Thank you on your bracing insigth and suggestion. Yes, Ive done prunning and established crown before I left it. Good Luck to youu too on your exquisite hobby.